Christian music has seen the rise of numerous stars in the last few years- one of which, Chris August, has taken the CCM world by storm. Ever since the release of his debut- No Far Away in 2010, August has been one of the most successful and popular new artists. 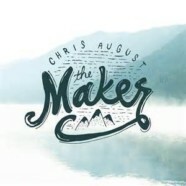 August’s third album, The Maker continues to build on everything he has built up thus far. While there isn’t much new in the way of actual music, the message is one of the strongest August has given us yet. The album starts strong with the title track and leads right into “I’m In Love With You,” which can and will be used by couples everywhere. One of the many standout tracks and possibly the standout is “Drop The Stone,” which talks about John 8:7 where Jesus came across a group of people casting judgment on an adulterous woman and he told them that whoever was without sin could cast the first stone. With The Maker, August channels some of the deepest parts of his soul and lays his heart out for everyone who will listen. This is Chris August at his best and he doesn’t hold anything back. This should be a contender for album of the year.